I love going out for Sunday brunch. It always seems like a special occasion and I never feel guilty about indulging in my favorite rich, savory foods. 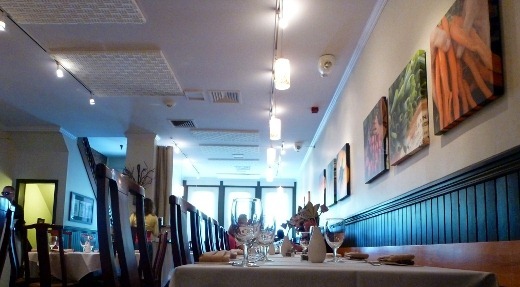 This Sunday I redeemed a LivingSocial deal at Grange Kitchen & Bar, a restaurant at which I had never previously eaten, but had been eager to try. I noticed that Grange sold a rather large quantity of their LivingSocial brunch deals, and when I attempted to make an online reservation for brunch one Sunday, I received a message that there were no tables available at that time for the next eight weeks! Was it really that booked!? To investigate (I am skilled at such things), I emailed Grange, and received a prompt reply to my inquiry, notifying me that brunch reservations were currently being taken only for parties of six or more, so we could feel free to stop on in for a table any Sunday, when brunch is served between 10:00 AM and 3:00 PM. Sunday morning, we made a point of arriving early, to avoid waiting for a table, and wait, we did not! We arrived shortly before 10:00 AM, and there were a dozen or so people already waiting outside for tables. We were seated at a table for two within a few minutes and there was still plenty of room to spare in the restaurant until at least 10:45 AM or so, when the tables began to near capacity. Above: Our LivingSocial deal included a specialty cocktail and brunch entrée for each of us. 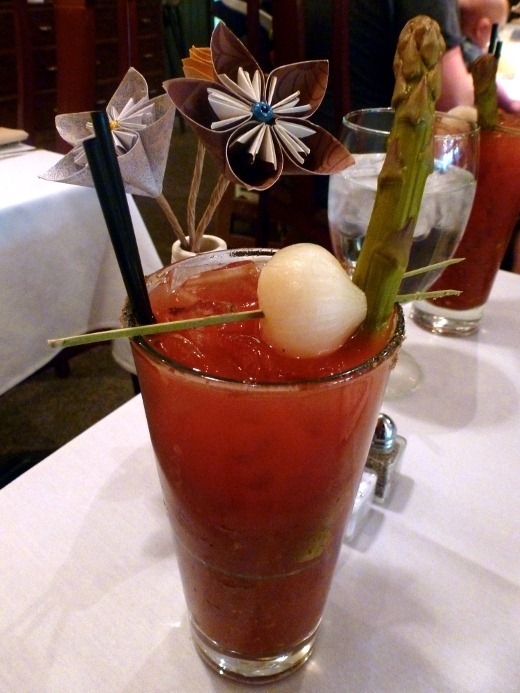 The huz and I both ordered a Michigan Mary, which is a Bloody Mary made with locally-sourced ingredients, including pickled vegetables, garnished with an asparagus spear, pearl onion, and celery salt rim. The prominent flavor was most definitely the pickling juice! Nice and bold and salty, which is just what I crave during the brunch hour. Below: Inside Grange. 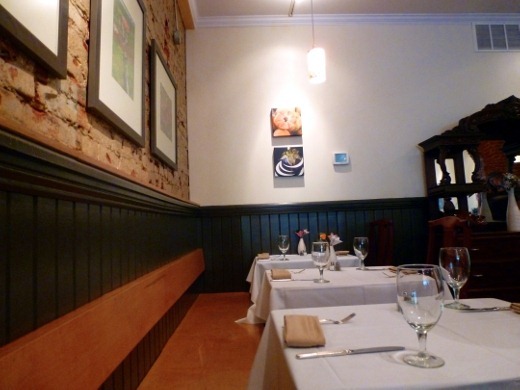 The décor is minimalist, with fresh white walls, crisp white linen, exposed brick, and dark wood paneling. Unframed canvases featuring pictures of fresh, whole foods decorated the walls. The flooring is a rather drab carpet. What wonders a lovely wood floor or modern slate tile would do for this place! The restaurant’s food concept is rather progressive, highlighting seasonal, locally-sourced ingredients, and I think the décor could just use a leeeettle more love, to match. I can’t help but compare Grange’s brunch to Ravens Club’s brunch, and I have to say that Grange offers not only more options for brunch, but also more enticing options. (Grange’s food tasted better too!). As you may have caught on, I am a savory brunch girl! 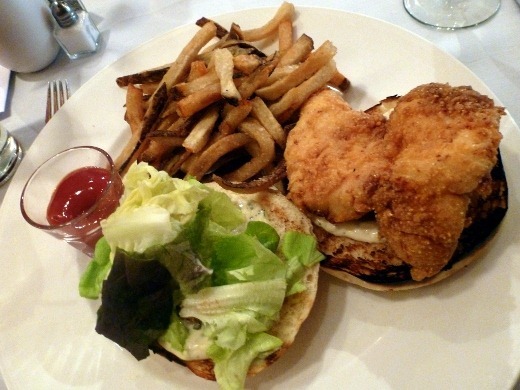 I ordered Grange’s Fish Sandwich for brunch, which was a cornmeal crusted walleye on a remoulade-dressed bun, served with fries. The fish filet was just delicious – well-seasoned, crisp, grainy cornmeal crust covering a tender, flaky, meaty filet of walleye. The remoulade was a wonderful enhancement to this great piece of seafood. The sesame seed bun was the only part of the dish that left a bit to be desired – it was just a bit dry and bland to me. Sea salt was visibly sprinkled all over my fries – mm hmm! That’s how I like my fries, toots! Next time, if I were to order such a salty brunch entrée, I would probably order a sweeter beverage to accompany my meal, rather than the salty, reminiscent-of-pickles Michigan Mary cocktail that I had, just to balance things out. With that said, I was very pleased with my entrée – super delicious! For the huz: Grange’s Brunch Burger. 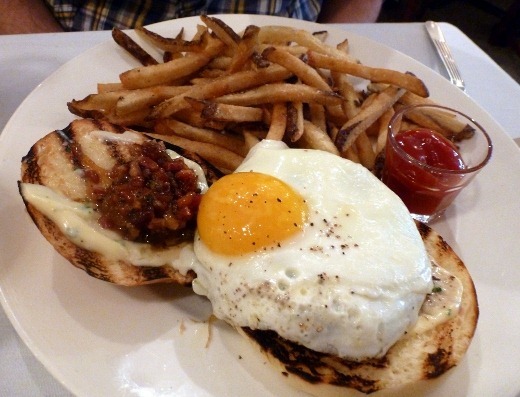 A beef burger topped with a fried egg, bacon jam (!!! ), roasted garlic mayo, atop a sesame seed bun, with a side of fries. He said it was quite good! I should also mention that we were pleased by the friendly service we received at Grange from our Russell Brand-look-alike server. The wait for our brunch entrees was just a tad long, but we we understanding, given that we were amongst the the first diners of the day. It was nice to sit and leisurely enjoy our brunch cocktails on a Sunday morning. 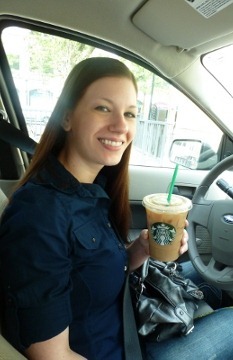 After a brunch dominated by salt, we stopped by ‘bux for some sweet iced lattes. 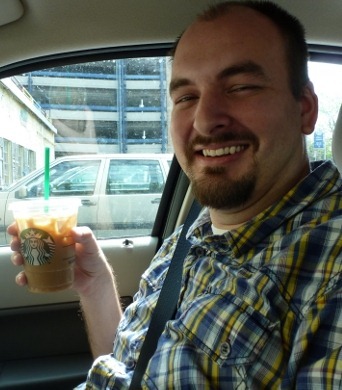 (Worst pic of me evAR!). Nice post about Grange brunch. Next time try the duck hash, it’s fantastic! Pingback: Grilled Chicken and Veggie Quesadillas | Meg.Goes.Nom.Nom.